Philippines, presents a van that seeks to redefine luxury, the Toano. Specially designed by the original Mercedes-Benz Sprinter car design team based in Stuttgart, Germany, the Foton Toano combines elegant and expansive interiors with a powerful, Cummins turbo diesel engine to provide a truly luxurious ride. Ample and comfortable seating for up to 15 passengers is matched with a high ceiling, making standing upright inside the vehicle doable, while a long wheelbase (measuring at 3,750mm) makes for a stately, comfortable, and safe ride. The Toano runs on Foton’s signature, and by-now familiar power plant, the 2.8-liter ISF Cummins CRDi turbo diesel engine outputting 160 horsepower and 360 Nm of torque. It’s the same unit found on the brand’s very capable Toplander SUV and Thunder pickup truck. A proven engine, it’s also Euro 4 compliant, meeting the government’s call for reduced emissions. Mated to a 6-speed manual, the Toano is best piloted by a chauffeur especially on long trips. The spacious, high-ceilinged interior features light-colored fabric seats with individual head and back rests, AM/FM radio, CD player, aux and USB audio inputs, and remote control power windows. And while the Toano offers what can be described as a comfortable living space, a new variant, the Executive, features a nautical-themed interior complete with an LED television and audio-visual suite. Outside, there’s an automatic, electric footboard, reverse cameras and sensors, and a split vertical rear door. Standard are LED side-mirror signal lights, dual front airbags, and ABS with Electronic Brakeforce Distribution. Available color variants are Aurora White, Metallic Silver, and Amber Bronze. 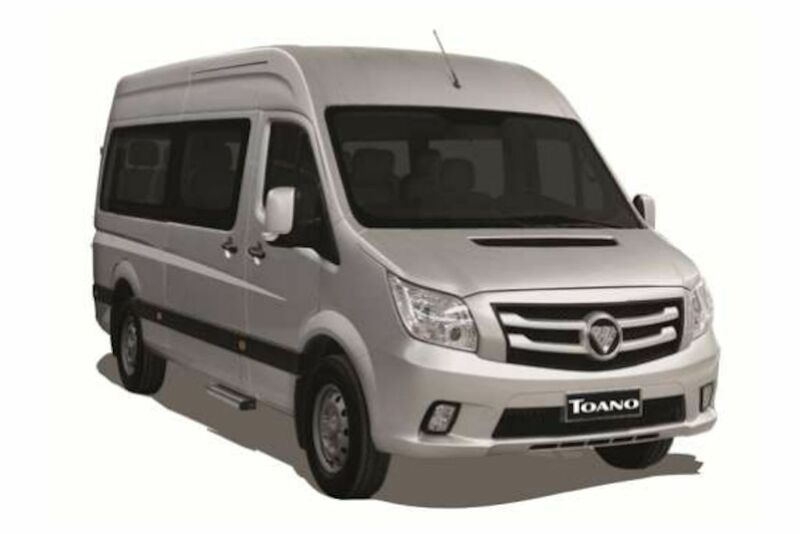 The Foton Toano starts at P 1,688,000 for the 15-seater variant. Equally affordable, the Toano also comes with a 5-year, 150,000-kilometer warranty. This makes it a great value-for-money luxury van that’s affordable while being equivalently competitive against its rivals. Yes...but you know what? you will not ever ever and ever understand what a "REDEFINE LUXURY" is, unless you need to start to appreciate the car. I think you're the one who doesn't understand what "Redefine luxury" means. Anyway, the van looks like a delivery van. I doubt that it would sell well here and I even doubt that I would ever see one on the road. Then come and visit San Fernando Pampanga town proper...for easy access, just take a bus from Cubao (take Victory Liner). Considering Volkswagen is going to sell something as big with a 2.0 engine? Same power output? It's fine. Foton? Redefine luxury? You gotta be kidding! No one who's not on a budget and used to buying luxury cars left and right would be caught buying a Foton. Well, maybe for palengke duties, but not for going to a wedding held at Manila Hotel.